Dog training doesn’t have to be boring. In fact, it should be fun and exciting, an awesome adventure. When it’s fun, it’s not work. A case in point, this weekend I was in eastern Ohio with two clients’ dogs; Joey, a Brittany Spaniel and Holly, a Golden Retriever. As I drove through a little quaint town called Olmstead Hills, I saw a beautiful river with large stone slabs that framed it’s banks. So I turned my truck around and decided to explore it with Joey and Holly. They are in their early stages of obedience training but can now walk with each other on loose leashes. 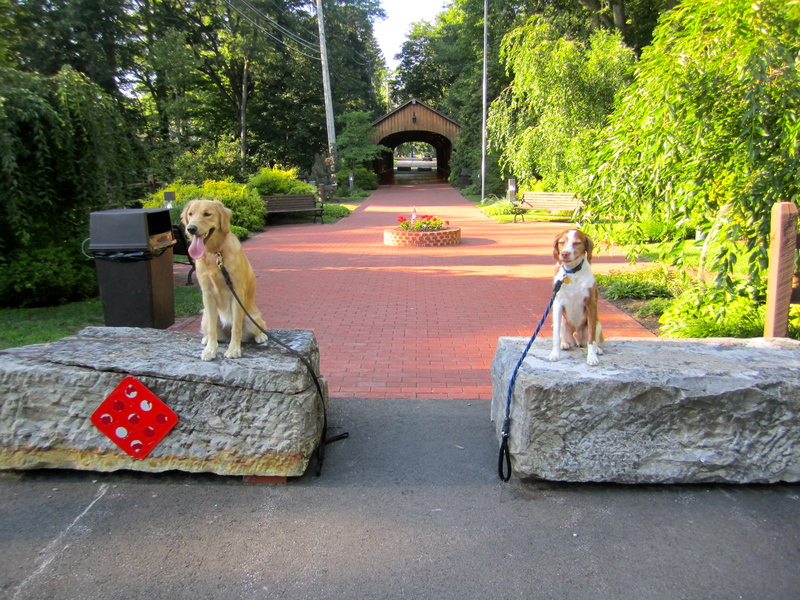 So this was a perfect opportunity to explore a beautiful natural setting and practice their new obedience skills. So what did the training session look like? For starters, they have quickly learned that if they’re patient and wait for their leashes to be put on instead of trying to barge out of the crates; they will be verbally released to start their exploration. Then there was the hike along the river, greeting friendly visitors along the way, exposing the dogs to numerous distractions (bicyclists, rollerbladers and playful children), exploring the river’s banks and venturing out to large stone slabs that framed the river. Of course, when they were in picturesque spots, the camera came out of my pocket so that the excursion could be later shared with their owners. This of course provided a perfect opportunity to practice sit, down and stay as well as a place command. 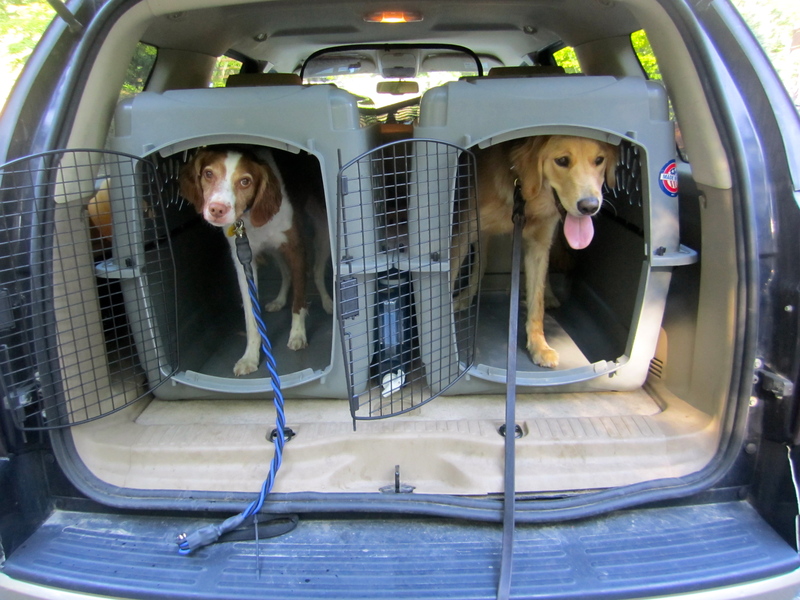 At the conclusion of the fun hike (dog training session), the dogs practiced their sit stay once again while the lift gate of the truck was opened. They calmly maintained their sit stay while the crates were opened and as they waited to be individually cued to jump into their crates. They then peacefully fell asleep and I’m sure they were dreaming about their awesome dog adventure which in truth was really a fun dog training session. 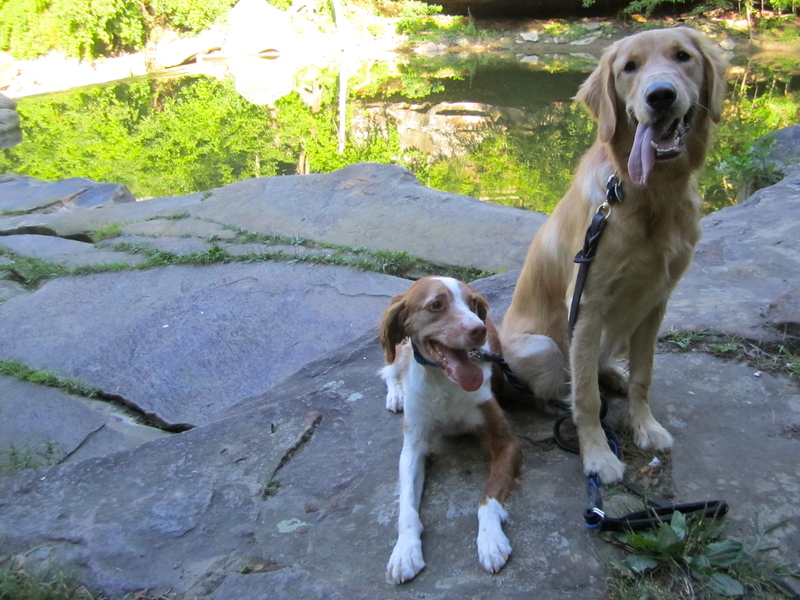 This entry was posted in Dog Training Tips, Uncategorized and tagged Brittany Spaniel, dog, dog hike, dog training, Golden Retriever, obedience training, Sit Stay. Bookmark the permalink.